The vibrant and diverse contemporary art and cultural heritage of the Caribbean island of Curaçao will be the focus of an exhibition in the gallery of the Hope College De Pree Art Center opening in August. The gallery will feature "Island Reflections: The Contemporary Art of Curaçao" from Friday, Aug. 19, through Saturday, Oct. 1. In addition, on Friday, Sept. 9, there will be an artist talk at 4 p.m. and an opening reception at 5 p.m. 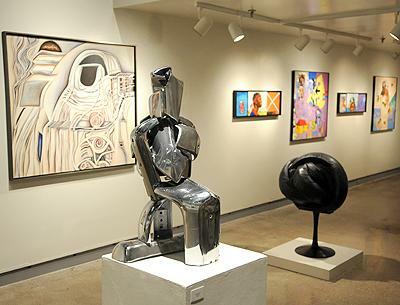 The exhibit, artist talk and reception are open to the public. Admission is free. The exhibit has been curated by Susan Wilczak, a part-time lecturer in art history at Hope College. Curaçao is a small southern Caribbean island just off the coast of Venezuela that is an independent nation within the Kingdom of the Netherlands. Wilczak first visited Curaçao in January 2010, and was immediately impressed by the island's vibrant, diverse, unique and refined art community. She has developed "Island Reflections" to share the artists' insights, and Curaçao's art and culture, with the larger world. "Everything about the island is unique, including its widely used language, Papiamentu, which is one of the last remaining Creole languages in use in the world today," she said. "Its music, dominated by the ancient rhythm called Tumba, was a fore runner of rap beats. Its architecture, heavily influenced by the Dutch colonists, is unique to this island." "For this exhibition, I have chosen 10 artists living and working on Curaçao who represent a wide range of styles, medium, material and subject matter, and present a rich, complex, multi-vision of Curaçao using the inspiration the island has provided them," Wilczak said. "These artists' reflections are a result of the diversity of the history of the island: Dutch influences, multi-cultural influences, slavery, politics, religion, trade, industry, natural environment and island life itself." Featured artists are Herman Van Bergen, Carlos Blaaker, Hortence Brouwn, Ariadne Faries, Ria Houwen, Yubi Kirindongo, Midzy Longuevergne, Tony Monsanto, Ellen Spijkstra and Philippe Zanolino. Several of the artists were born on Curaçao, but some have also found their way there from places such as the Netherlands, France and Surinam. "To me and for this exhibit, a Curaçao artist is one who is associated with the island by virtue of place of birth or by establishing an artistic life and reputation on the island," Wilczak said. "With this connection comes a wide variety of subject matter, perspectives and personal insights which are inspired by the island and strongly reflected in the artists' work, thus the exhibit title: 'Island Reflections.'" The De Pree Art Center is located at 160 E. 12th St., on Columbia Avenue at 12th Street. The gallery is open Mondays through Saturdays from 10 a.m. until 5 p.m. and Sundays from 1 p.m. until 5 p.m., although the hours may be reduced during breaks and holidays. The gallery is handicapped accessible. The final opening for the Hope Summer Repertory Theatre will be the musical Guys on Ice opening Monday, August 1 at the Knickerbocker Theatre in downtown Holland at 8 p.m. Book and lyrics are by Fred Alley and music is by James Kaplan.